The Black Country Ring encompasses the Cannock Chase woodland, a medieval royal hunting forest, with wild deer still roaming this SSSI. It takes you through the City of Birmingham, but also includes a lot of countryside . 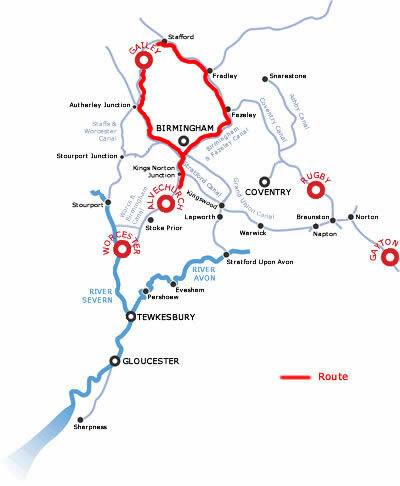 The route is a varied mix of urban and countryside and offers family activities along the way. The small town of Alvechurch is set below the canal in a hollow, it has some fine half timberered houses and has local stores and takeaways. There is a pub Canalside in the Marina- The Weighbridge Inn. Turn north towards Birmingham and the ridge of hills is in the distance. You pass a couple of Reservoirs to your left popular with bird watchers and walkers , the scenery is very pleasant and rural. At Hopwood the Hopwood House Inn is Canalside at bridge 67 . Soon the very long Wast Hills Tunnel beckons, and you will leave rural Worcestershire and pass into Warwickshire and the Black Country. The Tunnel is 2726 yards long, so don your waterproofs as you will get dripped on, its one of the longest tunnels in the country! The tunnel emerges in Kings Norton , bridge 71 is the best access point for shops, and after a mile you turn right at Kings Norton Junction, note the old canal house just before the junction. Continue northwards towards Birmingham, and you soon past Bournville. The Bournville Estate was started in the late 1800's , and now Cadburys World is open to visitors and is a chocoholics dream! Booking is required. There is mooring for visitors. You can also walk through the Works to Selly Manor and Minworth Greaves- 2 half timbered Birmingham houses of the 13th and 14th Centuries. At Bournville Station walk west to the Cadbury's entrance, take Birdcage walk through the Works , bear right at the fork then turn right at the village green. You pass through Selly Oak and past Birmingham University, and Edgbaston which is home to Warwickshire's County Cricket Ground- an England Test Venue. After the short Edgbaston Tunnel abot 1/2 mile to your left is the Birmingham Botanical Gardens & Glasshouses which are open to the public. About 1/4 mile west of Bridge 86 not too far from the Plough and Harrow Hotel is Perrott's Folly, a 7 storey tower built in 1758 and claimed to be Birmingham's most eccentric building. It is thought that Tolkien based his Two Towers of Gondor from Lord of the Rings on this tower, and he lived opposite the Hotel for a time. The canal makes a sharp left turn into Gas Street Basin , and you can moor where-ever you find moorings, either here or continue on as there are many moorings around. Gas Street basin which is in the heart of Birmingham's canal network, has been has been redeveloped into a unique experience where traditional narrow boats moor up next to cosmopolitan cafes and bars. The surrounding area is a vibrant arts and entertainment area and there are many shopping options within a short walk. You can also moor at the Cambrian Wharf by the Sea life Centre which might be slightly quieter. 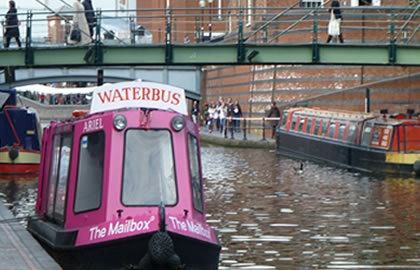 Go past the Gas Street Basin and turn right at Deep Cuttings Junction, the Cambrian Wharf is by the Sea Life Centre. It is 4 hours to here (or slightly less as lock free). If you haven't done so already turn right at Deep Cuttings Junction past Cambrian Wharf and you will meet the Farmers Bridge flight of locks, you will need a BW anti vandal key..
From this point the locks fall steeply away from the heart of Birmingham. At Aston Junction continue left and northwards where you encounter the Aston flight of locks which takes the canal down 11 locks to Salford Junction. Aston Villa Football Club is about a mile to your left at Holborn Hill Bridge , and they offer Stadium tours , which is a chance to see behind one of the oldest Football clubs in the World. Aston hall is close to the Football Club , built in the 1600's this is one of the last great houses to be built in the Jacobean style . At Salford Junction turn right onto the Birmingham & Fazeley Junction. You soon pass Star City on your right, Star City is one of the UK's largest leisure destinations - a unique family entertainment destination with 12 restaurants and 11 leisure attractions including a 25 screen VUE cinema. Funfairs, fireworks displays and other exciting family orientated events regularly take place at StarCity, including high-profile attractions such as the Moscow State Circus and Cirque De Soleil. It is also home to England’s largest Indoor Adventure Golf Complex, a 22 lane ten pin bowling alley, a purpose built all-weather 5-a-side football center, a Laser Station and a Twin Peaks Family Climbing Centre. All shops are readily available alongside the canal beyond Salford, a good access point is where the A452 crosses the canal at Tyburn bridge. The Minworth Locks are soon reached and begin the descent towards Fazeley & there is a handy transport cafe near Hansons bridge. There are also pubs – the Hare & Hounds by Minworth Green bridge, and The Boat by Caters bridge. You soon reach the outskirts of Wolverhampton, and the junction of the Shopshire Union Canal with the Stafforshire and Worcester at Autherley. Continue on down the Sattf & Worcs as you will soon reach the Aldersley Junction where you turn left onto the Birmingham navigations. Continue down the main line of the Birmingham canal, ignoring the left turn up the Wyrley & Essington Canal, and later on the Wednesbury oak Loop also on your left. At Tipton Green keep straight on, ignore the turning down to the Black Country Museum . Keep on the Birmingham main line towards the Gas Street basin which is where you will join the Worcester & Birmingham Canal again on your way back to Alvechurch. The Birmingham Level main Line past Tipton Green is very uninteresting until you again reach Deep Cuttings Junction where you turned at the start of your journey! Retrace your steps and perhaps moor for the night at Hopwood House pub which is 9.5 hours cruising today, and leaves you just an hour to do tomorrow.